Pretty neat looking. What did you do/use to make the metal portion? Thanks! Not sure what you mean, the plates were made by at first creating a grid, with the line tool and the making an outline to those, which is faded to alpha at the outside. After that i just used that grid with whitebackground as heightmap -> Creating a Normalmap with the GIMP Normal-Tool. If you mean the metal itself. 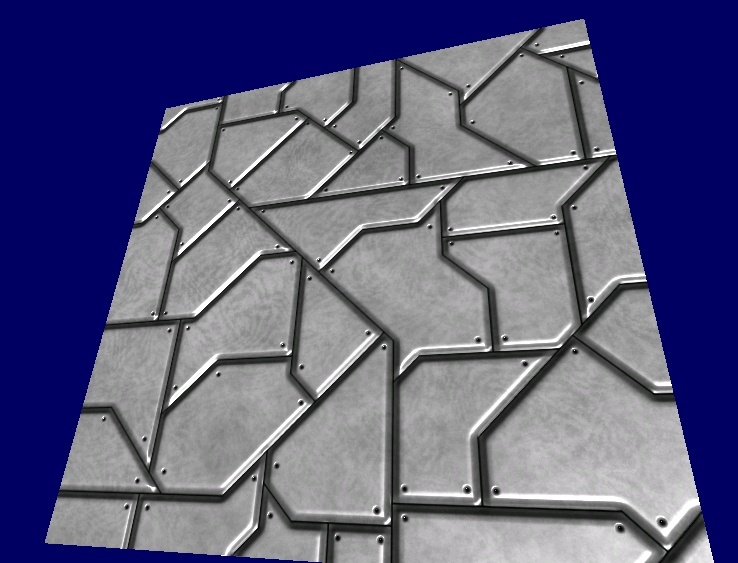 That is just made with a cloud generation with 2 shades of grey (Source 1.tga in Source.zip). After that i added another layer with a grid of another 2 shades of grey, which I distorted extremely (Look Source2.tga in Source.zip). Then I put them together using the "Reflective" Blend Method in Paint.Net and Alpha 64 for Source2. That's all for the metal background. The result was really nice IMO, although the work for creating it wasn't much. It was the metal itself, thanks for the explanation. I was just thinking today that a design of that type would be perfect as a skin texture. If the texture were elevated via 3D modeling, it would probably reflect light realistically enough to be indistinguishable from real skin.